Cuba, located 93 miles south of the United States, has approximately 11 million inhabitants and a land mass almost three times the size of the state of Louisiana. If Cuba were a state within the United States, it would rank 7th in population. This country is brimming over with natural resources—from its rich soil and mineral deposits to one of America’s greatest deep-water ports, located in La Habana. Prior to the revolution in 1959, Cuba had close trading ties with the U.S. Trade was very important to Cuba’s economy, accounting for 57% of the GNP. The U.S. was Cuba’s principal trading partner. In 1958, approximately one third of all goods passing through the Port of New Orleans were destined for Cuba. In 1958, Cuba was Louisiana’s number one trading partner in imports and number seven (7) in exports. Imports amounted to 1,232,000 tons consisting of: sugar (988,000); molasses (234,000); vegetable fiber (2,000); fruit (900); and pigment paints and varnishes (900). Exports amounted to 269,000 tons consisting of: flour (51,000); chemicals (36,000); grain (35,000); vegetables (27,000); animal feed (22,000); and lumber (20,000). As Louisiana’s largest single trading partner, over 6,000 Louisianians were employed in Cuba-related commerce.2 During this time, in the service sector, approximately 85% of Cuba’s business was done with the U.S., most notably in the areas of banking and insurance. Likewise, 85% of foreign tourists visiting Cuba were United States citizens. Cuban government sources reported that the Gross Domestic Product (GDP) increased 0.1% from January 1998 through June 1998, in part, the result of a 25% decrease in raw sugar production and decreasing commodity export prices. The sources said while government officials continued to publicly state that the GDP could still increase 2.5% to 3.5% for 1998, the reality was a 0.5% to 1% increase.3 From 1989 to 1993 the GDP contracted by 35%, which at the current rate, will not achieve 1989 levels until 2014. For the three decades following the imposition of the U.S. embargo against Cuba in 1962, 70% to 90% of Cuba’s international trade was with the former Soviet Union and the Eastern bloc. From 1965 to 1975, the Cuban economy grew at an annual rate of about 2%. Reflecting the policy of détente, in 1975 the U.S. embargo was modified to permit trade with Cuba by foreign-based subsidiaries of U.S. firms. Partially as a result of this, from 1975 to 1989, the Cuban economy grew at an annual rate of about 4%. Dissolution of the Soviet Union and the COMECON (Council for Mutual Economic Cooperation) trade group in 1989 dealt a severe blow to the Cuban economy. Exports from the former Soviet bloc to Cuba declined by about 70% from 1989 to 1993 the value of imports from all sources declined from $8 billion to $1.7 billion. In 1992, the implementation of the Cuban Democracy Act in October eliminated the ability of subsidiaries of U.S. companies to trade with Cuba. Despite U.S. policy discouraging trade with Cuba, companies from over 100 countries maintain trade relations with the island. Presently, over 600 foreign businesses have offices in Cuba, while Cuba engages in commerce with approximately 4,500 companies. In the area of joint ventures, over 350 companies representing 50 countries have entered into this form of arrangement with government-operated companies. Countries like Japan, Mexico, Canada and other Caribbean countries have the most important trade and investment projects with Cuba. On the other hand, Cuba exports sugar, coffee, seafood, and citrus products and imports spare parts, medical products, and construction equipment. Bilateral trade with Japan was US$150 million in 1997. Current bilateral trade between Mexico and Cuba exceeds US$400 million annually. According to statistics issued by the Government of Canada, peas, poultry, sulfur, and wheat accounted for approximately 25% of Canada’s approximately US$225 million in exports to Cuba in 1997. Nickel, shrimp, sugar, and cigars accounted for approximately 90% of Canada’s approximately US$250 million of imports from Cuba in 1997. The Ambassador of Canada to Cuba, reported that Canadian companies were negotiating joint ventures that could result in more than US$1 billion in new capital entering Cuba during the next two years. Bilateral trade between Cuba and Caribbean basin-area countries (those which border the Caribbean Sea including Mexico and Venezuela) was $1.335 billion in 1997, representing 20% of Cuba’s total foreign trade in 1997, compared to less than US$1 billion in 1996. The Ministry reported that 1997 bilateral trade was US$450 million with the Caribbean Sea-area countries, 3 times what it was a few years ago. Preferential trade agreement negotiations were taking place with the Caribbean Economic Community (CARICOM). Twelve joint ventures were reported between companies within Caribbean Sea-area companies and Republic of Cuba government-operated companies. In July of 1998, total foreign investment in Cuba exceeded U.S. $5 billion, concentrated in basic and light industries, tourism, food processing, agriculture, and construction. Companies from Italy, France, Spain, and United Kingdom account for 50% of existing foreign investment, while Canadian companies represent an additional 20%. Companies from Mexico, Argentina, Venezuela, and Chile account for an additional 18% of foreign investment. Such investment has spurred the interest of many American business executives. While in 1994 over 500 American businessmen traveled to Cuba, by 1997 this number had climbed to approximately 2,000. In 1998, an estimated 2,500 American executives visited the island. Tourism has replaced sugar and nickel as the largest foreign exchange earner for Cuba. In 1997, 1.17 million tourists visited Cuba, generating gross direct and indirect revenues of approximately U.S.$1.5 billion. In 1998, it is estimated that over 1.3 million tourists visited the island, generating gross revenues of approximately US$1.75 billion. This is especially interesting for New Orleans, which also depends on tourism for much of its economic activity. Cuba has approximately 28,000 hotel rooms, very close to the number in New Orleans. While Cuba reached the 1,000,000 million tourist-per-year mark in 1997, New Orleans receives that number in a month. Clearly, normalized relations, or simply the lifting of travel restrictions, would dramatically increase the number of American tourists visiting Cuba. On the one hand, this would present new challenges to the tourism sector in New Orleans. It would also present new opportunities for multi-destinational tourism, and cruise ships departing from New Orleans. Indeed, United States-based cruise ship operators could be early beneficiaries of the lifting of the travel restrictions. Such ships will be able to provide lodging for travelers as hotels in Cuba quickly reach capacity. One senior-level executive of a United States based cruise ship operator said that his company expects to transport 1,000,000 United States citizens to Cuba during the first twelve months of unrestricted travel between the United States and Cuba.4 While not included in overall estimates, if one such ship were to be based in New Orleans, it would create approximately 200 jobs. Presently, Cuba imports approximately US$800 million annually in food products. Primary imports include cooking oil, rice, wheat, corn, soy, powered milk, and poultry. In 1997, Cuba reported the value imports at US$4.5 billion, compared to US$3.880 billion in 1996. Total imports in 1997 were reported to be US$4.5 billion, compared to US$3.880 billion in 1996. Grain: Cuba presently imports approximately 500,000 tons annually of feed grains such as corn, barley and sorghum. The Washington, D.C.-based, U.S. Grains Council believes that Cuba would shift its current supply channels, mostly based in Canada and Europe, to the U.S. in the event of the legalization of the sale of bulk food commodities. As much of U.S. grains are produced in the mid-west, much of these exports would pass through Louisiana. While it is clear that Cuba imports many Louisiana products, rice growers in Louisiana, and ports that specialize in this product, would especially benefit from the resumption of bulk food sales to Cuba. Prior to the revolution, the State of Louisiana, along with Arkansas, was one of the largest suppliers of rice to Cuba. Today, Cuba imports over 500,000 metric tons of rice, mostly from China, Vietnam, and Thailand. While Cuba has attempted to increase the domestic production of rice with assistance from China and Vietnam, the results have not yet significantly affected imports. In 1998, the National Union of Rice Companies of Cuba reported that drought affecting the eastern provinces would have a negative impact on production. Granma Province, which accounts for 45% of domestic rice production, reported that the reservoirs that provide water to the rice plantations were at 6% of capacity. Combined with the drought, Hurricane Georges also had a negative effect on production. As a result, Cuba was unable to achieve its production goal of 225,000 tons of rice. Oil: José Luis Rodríguez, Cuba’s Minister of the Economy and Planning, reported that decreasing international oil prices had helped to compensate for decreasing export revenues in 1998. International oil prices have averaged approximately 60% to 75% of their 1997 levels. The Government of Cuba reported it had spent approximately US$1.2 billion to import oil and oil byproducts in 1997. If current international oil pricing trends continue, oil import savings for Cuba would be between US$250 million and US$350 million in 1998. Domestic oil production continues to increase— 10% above 1994 production levels. In 1997 Cuba production of oil was 1.6 million tons. Almost 90% of the crude oil is high in sulfur content and can only be used for power and cement plants. 19 of 32 exploration blocks are currently under license with companies from Canada, France, and the United Kingdom. Cuba’s last discovery was Cupet 1X, an offshore well completed in late 1995. The well flowed on test at a rate of 3,700 b/d of 16 gravity crude. Cupet 1X was drilled by Canadian Northwest, a subsidiary of Sherritt International Corporation of Canada. The well’s depth was 2,800 meters and the water depth was 6 meters. Cuba currently produces crude with gravities of 10 to 27 in four fields: Boca de Jaruco (discovered in 1968), Varadero (discovered in 1969), Periféricos (discovered in 1972), and Pina (discovered in 1989). In 1963, the U.S. Government issued the Cuban Assets Control Regulations under the Trading with the Enemy Act. They remain in force, and were strengthened in 1992 by the Cuban Democracy Act. The regulations affect all people subject to American law as well as all foreign-based subsidiaries of U.S. companies. Except for informational materials, telecommunications, medical supplies and humanitarian donations licensed for export by the U.S. Department of Commerce, no products, technology or services may be exported from the U.S. to Cuba, either directly or through third countries. In addition, no vessel carrying goods or passengers to or from Cuba, or carrying goods in which Cuba or a Cuban national has any interest, may enter a U.S. Port. Ships which have called in a Cuban port may not dock in the U.S. for six months after visiting Cuba. Goods or services of Cuban origin may not be imported into the U.S. either directly or through third countries. The implementation of the Cuban Democracy Act in October of 1992 eliminated United States-owned foreign subsidiaries’ trade with Cuba. At the same time, however, regulations permitted the licensing by the Department of Commerce of the sale of medical equipment and supplies to Cuba, as well as international gateway telecommunications services between the U.S. and Cuba. In addition, it is legal to purchase informational materials such as artwork and publications from Cuba. As Table 1 indicates, exports licensed by the U.S. Department of the Treasury from January to May 1998 have included donated medicinal and pharmaceutical products, wearing apparel and other articles for relief or charity worth $795,825. These exports were licensed to leave the U.S. through Miami and Detroit. Latin American Trade with the U.S. The U.S. economy is the world’s largest economy, and for many years, has been the leading importer and exporter in the world. U.S.-Latin American trade constitutes an important portion of all U.S. trade. In 1996, four out of the top 25 U.S. markets were Latin American: Mexico, Brazil, Venezuela and Colombia; whereas only 3 were included in the top 25 Latin American suppliers: Mexico, Venezuela and Brazil. U.S. merchandise exports are composed of 86% manufactured goods, 9% of agricultural commodities, and 5% of other exports like mineral fuels and crude materials. The U.S. container market is rapidly growing due to the modernization of ports, especially those of South America, which is a rapidly growing market. Through the year 2020, the South American container market is expected to grow at an average annual rate of 7%. U.S. Employment Related to U.S. Exports U.S. exports of goods and services support a total of 11.5 million U.S. jobs. A commonly used trade fact by the Department of Commerce is to consider that on average, 19,100 U.S. jobs relate to $1 billion of merchandise exports. The state of Louisiana has an economic base consisting mainly of oil and natural gas exploration and production, shipbuilding and offshore facility design and construction, cargo transportation and seafood and agriculture production. With a population of 4.3 million people, and located on over 22 miles of waterfront along the Mississippi River and the Industrial Canal, the port of New Orleans and the maritime industry are crucial parts of the New Orleans and Louisiana area economy. 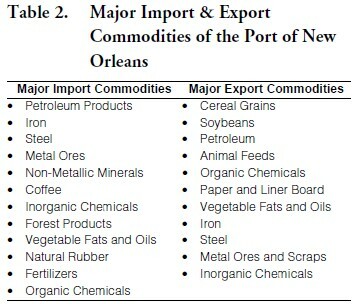 The Port, which serves as New Orleans’ gateway to the world, is one of the largest in the world, shipping a wide variety of U.S. imports and exports (see Table 2). Apart from the maritime industry, other export-generating industries in New Orleans include: the oil and gas industry and the tourism sector. The maritime industry generates most of the revenue and jobs related to exported goods and services in the state of Louisiana. In 1997 Latin America represented 33% of the Port of Louisiana’s operations. Even though most of the exports from Louisiana originate from the Central United States, in 1996 Louisiana was one of the top 10 exporting states in the U.S., with exports valued at $22.7 billion. The state of Louisiana ranks fifth among the states in exporting to Latin America. Latin America is also one of the most important markets for the Port. In 1998, imports from Latin America represented 19.4% of the Port’s operations, whereas exports represented almost 40%. Overall Latin America represented 23.8% of all the Port’s operations. Within the Latin American market, the Caribbean has been one of the fastest growing markets. Exports to the Caribbean have grown from 432,387 metric tons in 1992 to 712,531 metric tons in 1997. The Port of New Orleans’ Caribbean market share for 1997 was 18.9%. Trade between the United States and Latin America is expected to increase significantly in the next years. This is especially important for Louisiana and the Port of New Orleans which would benefit from this. Many Louisiana firms outside of the New Orleans metro area, most notably manufacturers and wholesalers, depend on the Port of New Orleans. A 1994 study conducted by Tim Ryan entitled the “Economic Impact of the Port of New Orleans and the Maritime Industry on the New Orleans and Louisiana Economies” estimated that in 1994, Louisiana firms related to Port activities accounted for a total of $11.44 billion in primary and secondary spending in Louisiana. This spending generated $2 billion in earnings and supported 94,492 permanent jobs statewide. This means that in 1994, the Port of New Orleans represented 5.3% of the 1,785,000 jobs in Louisiana. As of October 1998, the total employment in Louisiana was 1,978,000. Since the proportion of Port-related jobs has largely remained steady, we can estimate that approximately 104,708 jobs are currently (1998) generated by the Port. Since Latin America represents 33% of the Port’s operations, we can estimate that approximately 34,533 Louisiana jobs are supported by U.S. trade with Latin America. These jobs include those related to firms that are located in the New Orleans or in Louisiana simply because of the existence of the Port. The Port industry firms include large steamship companies such as central International Ship Holding; firms providing longshoreman services; railroads, tugboat, barge and trucking companies; law firms that hire maritime attorneys to handle legal work for the maritime industry; and insurance companies that write marine insurance. Water and Sewage: Havana’s deteriorating water and sewer system appears to require massive investment. Reports coming out of Cuba indicate that Havana’s water supply system loses approximately 50% of the water from the time it enters the system until it is delivered to the consumers. Electrical Generating System & Telecommunications: Like other infrastructure areas, Cuba’s electrical and telecommunications system is a mixture of pre-1959 American power plants and equipment and newer Eastern bloc plants and equipment. One third of its power plants are over 35 years old and in constant need of maintenance and repairs. Transportation, Emergency Vehicles & Parts: Cuba’s motor pool is in dire need of modernization. Apart from the American car of 1950s vintage, in the course of the 35 years under the current system, Cuba has received sporadic supplies of Argentinebuilt Ford products (1970s), Italian Alfa Romeos (late 1970s and 1980s), Soviet-built Ladas and modern Japanese and Korean compacts used mainly by rental agencies. Parts are in short supply, and vehicles are cannibalized for parts for others. Cuba’s heavy transportation equipment is in no better shape. Emergency-related vehicles, like helicopters, ambulances, fire engines, are also in high need. Sugar and Nickel Industries: Fifty seven percent of Cuban cultivated land is devoted to sugar and there are 156 sugar mills. However, due to continued low harvest levels, and various shortages and lack of repairs, only 102 mills were in operation in the 1994 harvest. By sheer volume alone, it is fair to say that sugar will continue to play a leading role in Cuba’s ability to trade with the outside world, and that the sugar industry will continue to be a magnet for Cuba’s future capital needs. Cuba’s sugar industry is in substantial need of new farm machinery, fuel, lubricants, fertilizers, herbicides, pesticides, sugar refining equipment, other technology and management skills. Together with sugar and tourism, nickel has historically ranked among the top hard cash earning industries in Cuba. Other Agriculture: Cuba’s overwhelming dependence on sugar has been detrimental to the development of other agricultural production. Nevertheless, Cuba produced an estimated of 1,015,000 tons of citrus and an additional 179,000 tons of fruit in 1993. These agricultural products include bananas, citrus, fruits, mangoes, pineapples, ginger, papayas, honey and seeds. Machinery, Equipment, Tools & Appliances: Opportunities abound in light industry, machine, tools, generating equipment, farming equipment, construction and mining equipment. The demand for kitchen appliances such as refrigerators, stoves, ovens, radios and VCRs appear to be the greatest. Biotechnology: The Cuban Government has invested a substantial amount of resources to develop its biotechnology industry. The Center for Genetic Engineering and Biotechnology is a favored project of the Cuban Government and its efforts have resulted in substantial export earnings for Cuba in the sale of meningitis B vaccine, interferon, and the heart attack medicine streptokinase. Pollution Control: As in other socialist economies, pollution control has been a problem. Havana Harbor is one of the most polluted bodies of water in the world. Similarly, oil pollution is a major problem in the Bays of Santiago de Cuba and Cienfuegos. Additionally, the sugar cane industry is a notorious source of pollution. Based on the size of Cuba’s economy compared to the rest of the economies in Latin America, we can estimate the tonnage of goods exported and imported represented by the Cuban economy for the Port of New Orleans. Therefore, if U.S.-Cuban trade was normalized, this would represent a value that ranges from 200,000 to 1,400,000 metric tons of imported and exported goods to Cuba passing through the Port of New Orleans. As Table 3 indicates, and based on the above, depending on the U.S. percentage share of Cuban trade and investment (ranging from 25% to 85%), and the percentage of this trade based in Louisiana (ranging from 10% to 19%), normalized U.S. trade relations with Cuba would create between 2,388 and 15,423 jobs in Louisiana. 1. This paper is an abbreviated version of a Public Interest Report by the authors titled Exploring the Potential Economic Impact on New Orleans and Louisiana of Normalized Trade Relations Between the United States and Cuba, Cuban Studies Institute, Tulane University (April 1999). The full report can be accessed on the internet at http://cuba.tulane.edu. 2. Port of New Orleans. General Operations “Trade Route Study” (1997). 3. Taken from ECONOMIC EYE ON CUBA© Index. 12 October 1998 to 18 October 1998 published on-line by the U.S.-Cuba Trade and Economic Council. 4. Taken from ECONOMIC EYE ON CUBA© Index 8 December 1997 to 14 December 1997 published on-line by the U.S.-Cuba Trade and Economic Council. 5. Port of New Orleans, General Operations. “Internal Document on Cuba” (1994). 6. ECONOMIC EYE ON CUBA© Index 17 August 1998 to 23 August 1998 published on-line by the U.S.-Cuba Trade and Economic Council.